Founded by the Etruscans, and surviving through both Roman and Lombard rule, Siena became its own republic in the 12th century and remained independent through a devastating wave of plague in the 1300s until 1555, when it became, through conquest, first part of the Duchy of Florence and finally the Grand Duchy of Tuscany. The friendly, small town feel of its compact center today belies the historic and cultural importance of Siena’s art and architecture, though it only takes a short exchange with any local to pick up on the enormous civic pride for which the Sienese are famous...and which feeds the flames of their legendary competitive nature. 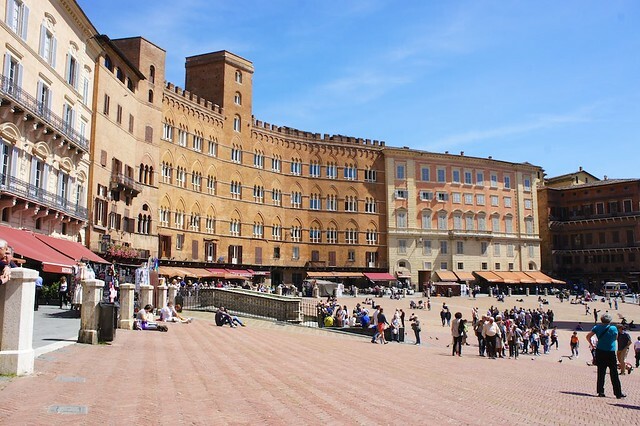 Siena’s most famous expanse is the oft-photographed shell-shaped Piazza del Campo, the town’s main square. Flanked by the Palazzo Pubblico, with its Sala della Pace decorated by Ambrogio Lorenzetti’s fresco cycle, "The Allegory of Good and Bad Government”, and the 14th century Torre del Mangia clocktower, the tallest tower in Italy when completed and still offering up gorgeous views over the city and Tuscan countryside, the piazza is perhaps best known as site of the annual Palio. When not packed wall to wall with people during the horse race, this is one of Italy’s most pleasant piazzas. 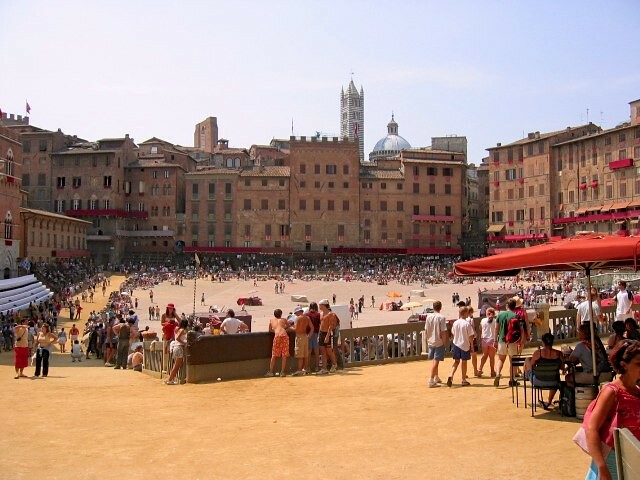 Dotted with students basking in the sun, retired folks catching up on local gossip, children kicking around soccer balls, and couples soaking up the romance of Tuscany, the Piazza del Campo seems sent directly from Central Casting for the starring role of town square. 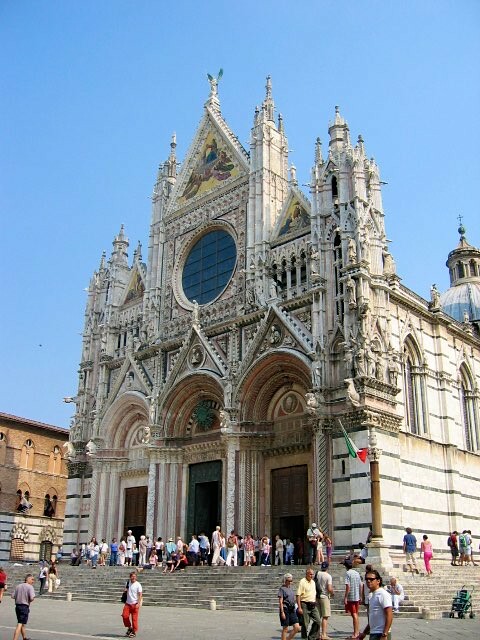 Siena is also home to one of Italy’s most stunning Romanesque-Gothic churches: its Duomo. Built between the 12th and 14th centuries, it was begun with the conceit of becoming the world’s largest cathedral. As so often happens, coffers weren’t as generous as imaginations, and when work was halted for lack of funds, what was to be a transept ended up serving as the church’s central nave, resulting in an unusual north-south axis. Inside, there are number of important works of art and sculpture, including Nicola Pisano’s octagonal pulpit, Ghirlandaio frescoes, bas-reliefs by Donatello and Ghiberti, and, in the cathedral museum, a number of paintings from the excellent Sienese school. Perhaps the most stunning work inside involves a bit of timing to view: the Duomo’s incredible inlaid marble mosaic floors, hidden most of the year under protective carpets, but uncovered for about two months between August and October for lucky visitors. More sombre, but perhaps for this very reason, profoundly moving, the synagogue is one of Italy’s most historic and reflects the importance of the local Jewish community in Siena from the 1300s. The Medici restricted Jewish citizens to a ghetto in the late 1600s, during which time the original building was constructed. The present synagogue dates from 1786, and has a plain facade as dictated by law at the time. Inside, there is a lovely Neoclassical and Baroque interior open to visitors. 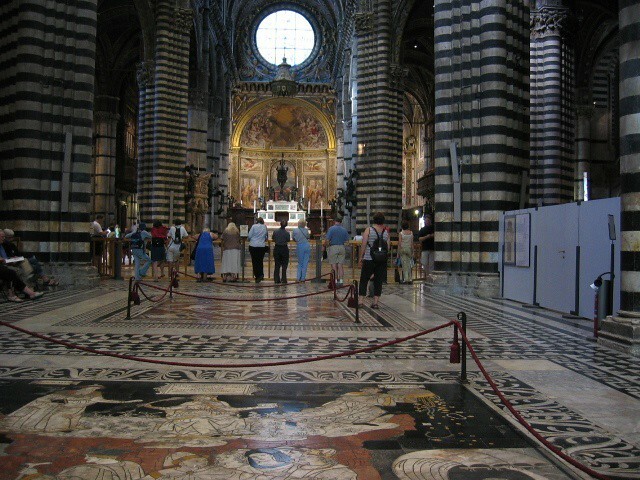 Siena was birthplace to Saint Catherine, now one of Italy’s two patron saints (with Saint Francis of Assisi). Relics of the saint are kept at the Basilica of San Domenico near the her birthplace, including her mummified head. Like most of Tuscany, Siena’s shopping can be divided into two rough categories: food and crafts. Siena is famous for a number of local sweet treats. Try the panforte, a low, dense fruitcake; ricciarelli, chewy almond cookies dusted with powdered sugar, and cavallucci, almond and honey cookies. The town is also deep in wine country, so stop by the Enoteca Regionale in the Fortezza Medicea to choose some of the area’s best vintages. There are a number of small gourmet shops (or the farmers’ market each Friday around the Fortezza Medicea) where you can pick up dried porcini mushrooms, truffle sauces, and wild boar sausage to pair with your Tuscan bottle. Local handicrafts center around handpainted ceramics (search out Il Pellicano and Bianco e Nero) and leather (Siena has a disproportionate number of shoe shops, as well, especially along the main Via Banchi di Sopra and Via delle Terme). An antique market is also held near the Fortezza Medicea on the third Sunday of each month. Though surrounded by great Tuscan food, Siena itself is strangely devoid of outstanding restaurants. Our favorite is Osteria Le Logge (Via del Porrione’ 33; Phone: +39 0577 48013) A popular spot with tourists and locals, the food is excellent and reasonably priced. This osteria occupies a beautiful classic vaulted space and has tables on the street in the summer. Otherwise, the casual Taverna del Capitano (Via del Capitano, 6; Phone: +39 0577 288094) and slightly more elegant Enoteca I Terzi (Via dei Termini; +39 0577 44329) are good choices.